I did a little simulation to examine how K and lambda vary in response to tree size (and how they compare to each other on the same simulated trees). I use Liam Revell’s functions fastBM to generate traits, and phylosig to measure phylogenetic signal. First, it seems that lambda is more sensitive than K to tree size, but then lambda levels out at about 40 species, whereas K continues to vary around a mean of 1. 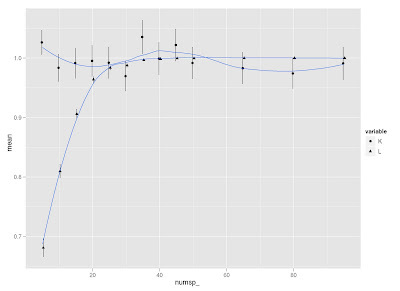 Second, K is more variable than lambda at all levels of tree size (compare standard error bars). Does this make sense to those smart folks out there?